Years ago Becca and her best friend Molly were held captive by a serial killer. Becca was able to escape, but has always felt guilty not knowing what happened to Molly. The killer was never found even after all of the information Becca was able to give the authorities. Having changed her identity, now an FBI agent, Becca has devoted her life to finding the serial killer known as Van Gogh. Having not killed in 16 years it seems that Van Gogh is back and Becca is determined that this time he will not get away. WOW, WOW, WOW! From the first sentence of Web of Secrets I was hooked! And the suspense just kept on building! At one point the suspense was so intense that I had to close my Kindle, but then immediately had to pick it back up to find out what happened. 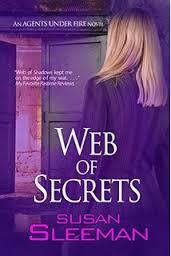 In Web of Secrets the reader gets a peek into the killer's mind and motives. There are some definite dark and brutal passages in the book. I thought Connor was the perfect romantic interest for Becca's character. He was tender and yet firm with Becca and knew when to push and when to back off. Both were holding back secrets that were keeping them from exploring their feelings for each other which caused some frustrating moments while reading, but that only added to the tension of the read. Romantic suspense is my favorite genre to read and Susan Sleeman never disappoints! Check out the quote on the front of the book! Yes, that is a quote from yours truly!